Bee pollen is a highly bioactive source of naturally occurring amino acids, bioflavanoids, carotenoids, enzymes, fatty acids, minerals, multi-vitamins, phytosterols and more. 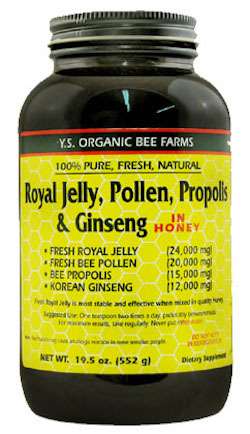 Propolis contains high levels of bioflavones and antioxidants. It has powerful natural antibacterial, antiviral, anti-fungal, antibiotic and deep immune supporting properties. Korean Ginseng is used throughout the Orient to build qi, physical and mental energy, stamina and longevity. Suggested Use: Take 1/2 - 1 tsp. twice a day in the morning and before bed followed by a small amount of water. For best results, take regularly on an empty stomach. Never mix with anything hot.